We support you to identify, understand, develop and implement your most appropriate course of action by supporting and facilitating organisational development and change management, based on our 'Organisational Sustainability Strategies’ model. 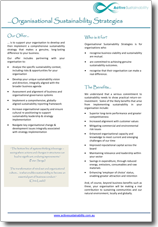 Download our Organisational Sustainability Strategies brochure to findout more about these services. Designed by Rod Cuffe - Paladin IT.